Tradition In Action is committed to defend the perennial Magisterium of Holy Mother Church and Catholic traditions. TIA also works for a restoration of Christian civilization, adapted to contemporary historical circumstances. 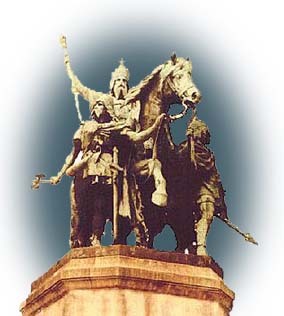 The TIA logo pictures the statue of the Emperor Charlemagne with his knights Roland and Olivier. This bronze monument stands in the front square of Notre Dame Cathedral in Paris. For more on Charlemagne, click here. Website editor is Atila Sinke Guimarães. To contact him, click here. We welcome your tax-deductible donation to TIA, Inc., a non-profit (501 c3) corporation. A traditional Mass is said each month for our supporters.